How Do We Increase Economic Mobility? As the Wall Street Journal reported several days ago, “Economic Mobility Is the New Flashpoint”. “Both parties agree the opportunity gap is widening, but the proposed solutions are starkly different.” The Democrats want to increase the minimum wage, extend unemployment benefits, and expand access to college. The Republicans suggest a whole potpourri of approaches such as reforming welfare (including food stamps), extending school choice, cutting taxes, and relaxing regulations on new businesses. A look at the latest jobs report from the Labor Department should provide the focus which Congress needs to figure out how to increase economic opportunity. Although the unemployment rate dropped substantially to 6.7% from 7.0% at the beginning of December, only 74,000 new jobs were created in December. 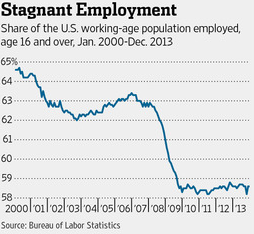 The explanation is that 347,000 left the labor force last month. The labor force participation rate, the share of the U.S. working-age population employed, age 16 and over, has dropped from 64.5% in 2000, to just under 63% at the beginning of 2008 to near a post-recession low of 58.6% last month (see chart below). In other words, Congress should be totally focused on speeding up economic growth in order to create more jobs. Since new businesses create the most new jobs, we should indeed relax as many regulations as possible which impede entrepreneurship. We should lower the corporate tax rate from its very high current value of 35% to get American multinational companies to bring their trillions of overseas profits back home for reinvestment in the U.S. Moving to a national consumption tax (see the Graetz Plan discussion in my January 7 post), could mean dropping the corporate tax rate to as low as 15%. Isn’t is obvious that the best thing we can do to give low income people an opportunity to rise up the economic ladder is to just give them a job in the first place? If they’re ambitious they’ll take any opportunity they can get and run with it! This entry was posted in Congress, corporate tax rate, economic growth, economic inequality, economic mobility, economic opportunity, Economy, entrepreneurship, inequality, Is America in Decline?, Jack Heidel, labor participation rate, pro-growth economic policy, pro-growth tax reform, Wall Street Journal, work incentives and tagged congress, economic growth, Economic inequality, economic mobility, economic opportunity, economy, jack heidel, Wall Street Journal by jackheidel. Bookmark the permalink.